The fourth Space Station assembly flight ISS-2A.2b utilized the SPACEHAB Double Module and the Integrated Cargo Carrier (ICC) to bring supplies to the station. SPACEHAB's Logistics Double Module was a 20-foot (6.1 meters) long, 14-foot (4.3 meters) wide, 11.2-foot (3.4 meters) high pressurized aluminum module carried in Atlantis' payload bay and connected to the middeck area of the orbiter by an access tunnel. For STS-106, the LDM carried approximately 8,100 pounds (3,674 kg) of hardware, equipment and logistical supplies to outfit the International Space Station. Designed to augment the Shuttle's middeck, the double module has a total cargo capacity of up to 10,000 pounds (4,536 kg) and contained the systems necessary to support the crewmembers, such as ventilation, lighting and limited power. The Integrated Cargo Carrier was an externally mounted, unpressurized, aluminum flatbed pallet, coupled with a keel-yoke assembly that expanded the Shuttle's capability to transport cargo. 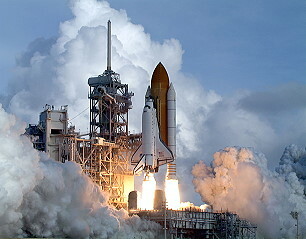 On STS-106, it carried 2,865 pounds (1,300 kg) of cargo to orbit. The ICC was eight feet (2.4 meters) long, 15 feet (4.6 meters) wide and 10 inches (25.4 centimeters) thick, with a capacity to carry up to 6,000 pounds (2,722 kg) of cargo. The goal of the flight was to prepare Zvezda for the arrival of the first resident, or Expedition, crew later this fall and the start of a permanent human presence on the new outpost. That crew, Expedition Commander William Shepherd, Soyuz Commander Yuri Gidzenko and Flight Engineer Sergei Krikalyov, was launched in a Soyuz TM-31 from the Baikonur Cosmodrome in Kazakhstan in late October for a four-month "shakedown" mission aboard the ISS. 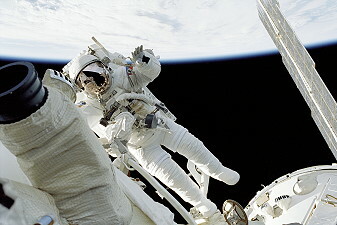 In addition, Edward Lu and Yuri Malenchenko conducted a 6-hour spacewalk on the fourth day of the flight to hook up electrical, communications and telemetry cables between Zvezda and the Zarya Control Module, whose computers handed over commanding functions to the Service Module's computers in a smooth transition in late July 2000. Edward Lu and Yuri Malenchenko also installed a magnetometer to the exterior of Zvezda. The magnetometer serves as a three-dimensional compass designed to minimize Zvezda propellant usage by relaying information to the module's computers regarding its orientation relative to the Earth. 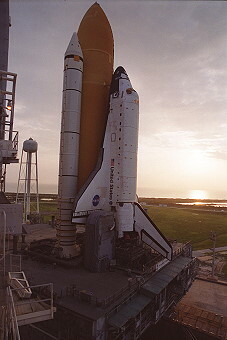 When Terrence Wilcutt guided Atlantis in for its docking with the ISS, he found the new station a much larger facility than the one left by the STS-101 crew during its flight in May 2000. 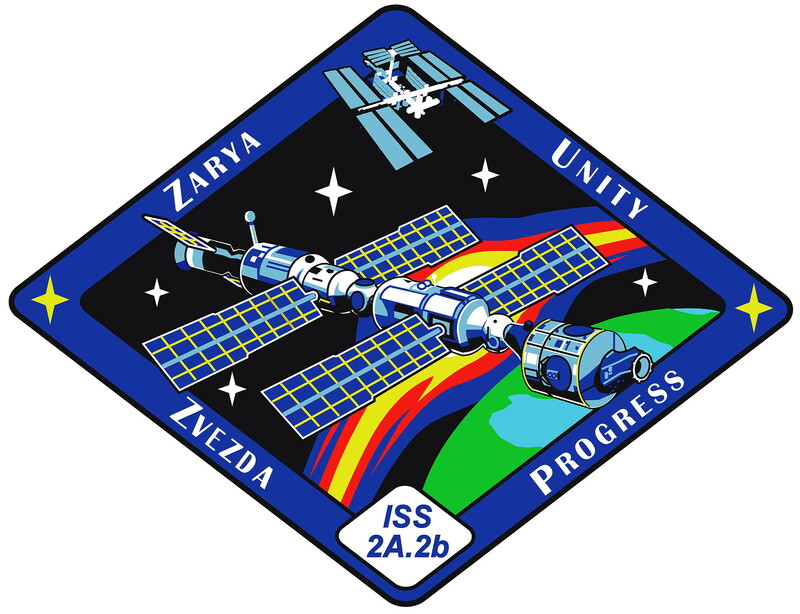 With the addition of the Zvezda and the Progress resupply ship, the ISS measured 143 feet (43.6 meters) in length, roughly the height of a 13-story building, and weighed 67 tons, twice the size of the ISS back in May 2000. The joining of Zvezda to the ISS and the arrival of the Progress provided about 8,800 cubic feet (226.5 cubic meters) of habitable volume for Station crew members, roughly the size of a comfortable apartment. By the time the U.S. 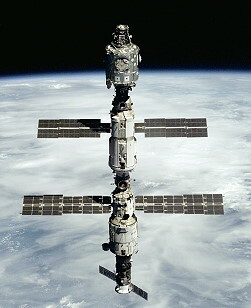 Laboratory Destiny was installed on the ISS in January 2001, the Station had surpassed both Skylab and MIR in total livable space. 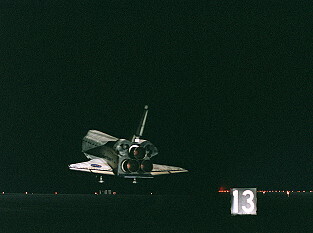 Following a two day solo flight the Atlantis docked with the ISS on September 10, 2000. 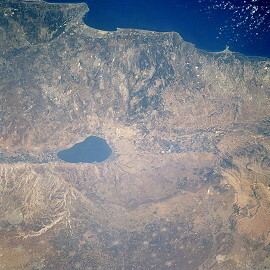 On the fifth day of the flight, Atlantis' crew entered the ISS, opening the hatch for the first time to Zvezda and to the Progress to begin unloading 1,300 pounds (590 kg) of goods from the Russian craft for the first resident crew, including items ranging from clothing to medical kits, personal hygiene kits, laptop computers, a color printer, vacuum cleaners, food warmers for Zvezda's galley, trash bags and critical life support hardware, including an Elektron oxygen generation unit and a Vozdukh carbon dioxide removal unit. Elektron and Vozdukh were unstowed from the Progress and moved into Zvezda, but were not installed and activated until the Expedition One crew arrived on board. The first toilet for the ISS was delivered to Zvezda on the last day of the crew's work inside the Station for installation this fall once the Expedition 1 crew is on board. 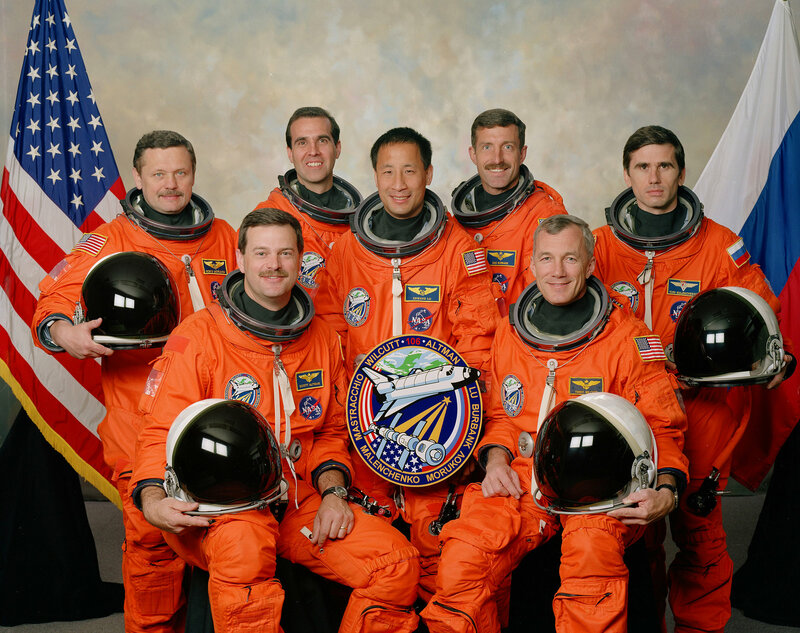 Among the first tasks facing Atlantis' crew were the installation of three batteries and associated electronic components in Zvezda and replacement of two of the six batteries in the Zarya module, completing the work begun by the STS-101 crew in May 2000. 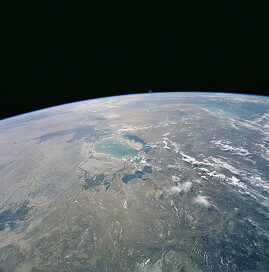 Zvezda was launched from Baikonur on July 12, 2000 with five of its eight battery sets already installed. Edward Lu and Yuri Malenchenko were in charge of the installation work in Zvezda. Also earmarked for Zvezda was the activation of two gas masks, which will serve as standard emergency equipment for ISS crews and three fire extinguishers. 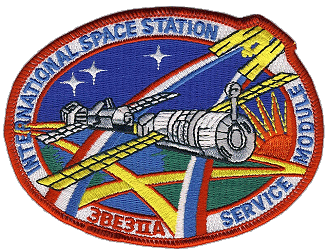 In addition, American-Russian power conversion units were installed in Zvezda on this flight to route electricity from huge solar arrays which were later installed on the STS-97 mission to the Russian modules. Electrical components to charge the batteries of Soyuz or Progress vehicles visiting the ISS were installed in Zvezda as well. 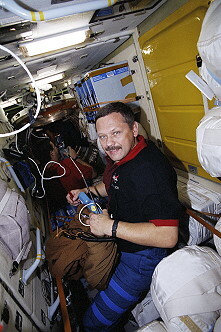 While Boris Morukov spent most of his time unloading supplies from the Progress, Richard Mastracchio was in charge of unloading 2 tons of equipment from the Spacehab module, including medical equipment for the ISS' Crew Health Care System, or CheCS, which serves as the heart of the station's clinic for orbiting crews, and a treadmill device and bicycle ergometer which serves as the first exercise gear for crews on board the ISS. Associated hardware for the treadmill which will prevent its use from disturbing sensitive microgravity experiments was installed by the crewmembers near the end of their stay on board. The Progress is an automated version of the Soyuz, and was developed to carry propellant and cargo to the Salyut and MIR space station. It serves the same purpose for the ISS. Although ISS has its own propulsion system, generally it is the Progress vehicle that performs periodic reboost maneuvers to maintain the ISS orbital altitude. The Progress is approximately the same size as the Soyuz, but it has a slightly higher mass at launch of approximately 7150 kg. The Progress spacecraft docks automatically to the ISS, and the TORU system acts as a backup remote control docking system. The Progress is composed of three modules: the Cargo Module, the Refueling Module, and the Instrument/Propulsion Module. 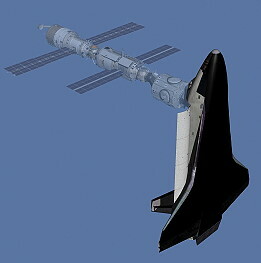 A modified version of the Progress M, called the Progress M-1, is planned for operation with the ISS. This version will have more propellant tanks for refueling, as the entire Refueling Module is devoted to fuel. Water will be carried in the Cargo Module. The Progress payload includes cargo in the pressurized Cargo Module and propellant in the Refueling Module. Excess propellant that is usually in the propulsion system tanks in the Instrumentation/ Propulsion Module can also be used by the ISS. The Progress Cargo Module is similar in construction to the Soyuz Orbital Module. The Cargo Module carries pressurized cargo that the crew transfers into the ISS through the docking hatch. After the Cargo Module is unloaded, trash, unwanted equipment, and wastewater can be loaded into the Progress for disposal when the spacecraft leaves the ISS. In place of the Soyuz Descent Module, the Progress has a module containing propellant tanks. The Progress is able to transfer propellant into the ISS propulsion system through fluid connectors in the docking ring. The propellant in the Refueling Module can also be used by the thrusters on the Progress vehicle for controlling and reboosting the ISS. The Progress M has four propellant tanks (two each for fuel and oxidizer) and two water tanks. The Progress M-1 had eight propellant tanks and no water tanks. 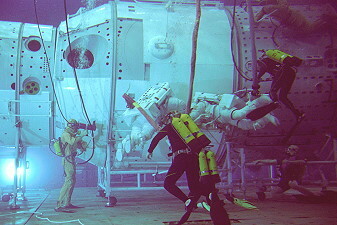 In the Progress M-1, water was delivered in separate containers carried in the Cargo Module. The Progress Instrumentation/Propulsion Module is similar to the module on Soyuz, but on Progress it is twice as long and contains additional avionics equipment. The larger Instrumentation Compartment carries avionics that would be contained in the Descent Module in the Soyuz. The only EVA was performed by Edward Lu and Yuri Malenchenko on September 11, 2000 (6h 14m) to complete final connections (electrical-, data- and television cables) between Zvezda module and component Zarya. The main objective of the space walk by Edward Lu and Yuri Malenchenko was to attach a 6-foot (1.8 meter) long magnetometer and boom to a port on the newly arrived Russian Zvezda Service Module. 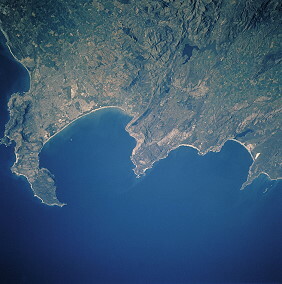 The magnetometer serves as a type of navigation tool, or compass, using data acquired from the Earth's magnetic field to "tell" Zvezda's computers how it is oriented in relation to the Earth. 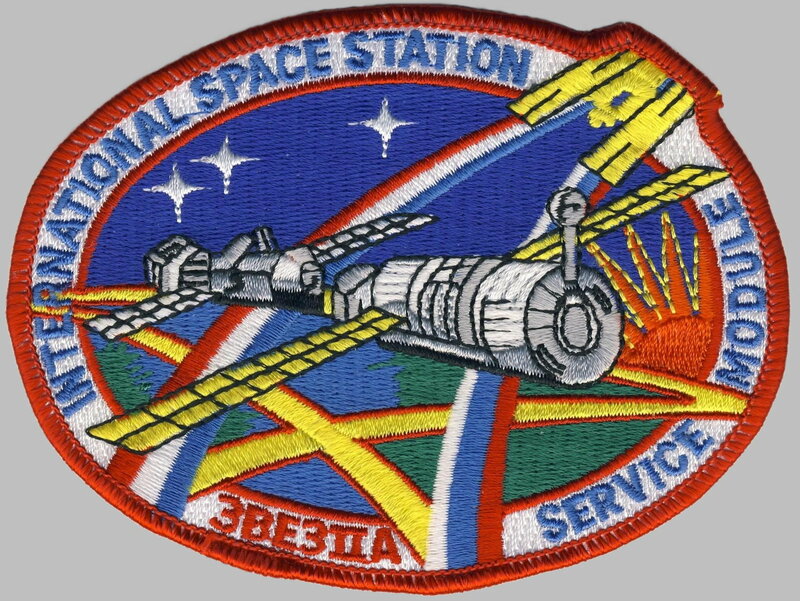 In doing so, Zvezda's propellent usage was minimized in maintaining the orientation of the ISS until the arrival in January 2001 of the U.S. Laboratory Destiny, which took over attitude control, or orientation, of the ISS through the Station's Control Moment Gyroscopes. With Mission Specialist Richard Mastracchio operating the Shuttle's robot arm and under the watchful eye of space walk choreographer Daniel Burbank, who both worked at Atlantis' aft flight deck, Edward Lu and Yuri Malenchenko rode the Canadian-built arm as far as it took them, about 50 feet (15.2 meters) above Atlantis' cargo bay. Then they used tethers and handrails along the ISS' modules to make their way to a point more than 100 feet (30.5 meters) above the cargo bay for the magnetometer installation, the farthest any tethered space walker has ventured outside a Shuttle. This portion of the space walk took about an hour and a half. 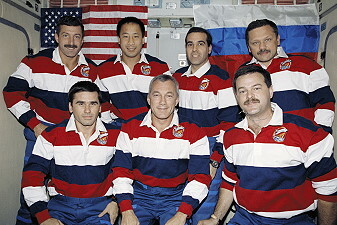 Edward Lu and Yuri Malenchenko were twice as high above the bay as were Story Musgrave and Jeffrey Hoffman during the STS-61 mission when they mounted the top of the Hubble Space Telescope to replace its magnetometers. Once the magnetometer hook up was complete, electrical, data and television cables between the newly arrived Zvezda Service Module and the Zarya Control Module to which Zvezda is docked were connected. In all, nine cables were rigged between the two spacecraft in the procedure. Four of the cables were critical power connections required before the end of the STS-97 mission to the ISS to deliver the sprawling U.S. solar arrays. These cables enabled power to flow from the arrays to the Russian modules to augment the solar arrays on both Zarya and Zvezda since the U.S. arrays shaded portions of the Russians arrays once they are installed on the top of the Z1 truss framework. Two of the cables provided an internal closed circuit video feed for crew members in Zvezda so they could monitor the docking of the second Russian Progress resupply mission to the ISS in late September 2000 which will linkup to the bottom, or nadir, docking port to Zarya. Two additional cables will link data from Zvezda to Zarya for, among other things, the commanding of Zarya solar array pointing from Zvezda now that theZarya's motion control system has been deactivated. A final fiber optic cable was strung between Zvezda and Zarya to enable data to flow from the suits worn by Russian space walkers once the ISS airlock is installed at the starboard port of the Unity connecting node to accommodate joint U.S.-Russian space walks. Until then, ISS space walks must be conducted from Zvezda's transfer compartment. 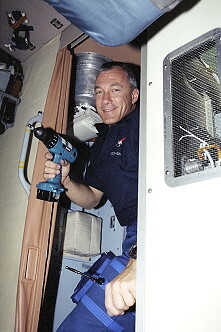 The crew transferred more than 6,000 pounds (2,722 kg) of material  including six 100 pound (45.4 kg) bags of water, all of the food for the first resident crew, office supplies, onboard environmental supplies, a vacuum cleaner and a computer and monitor  to the interior of the station. Additionally, a reboost was performed using the orbiter's Reaction Control System (RCS) to place the station in a higher orbit. The first initial amateur radio station was flown on board the space shuttle Atlantis on STS-106. The crew transferred the ham radio gear into the space station for future use by the Expedition One crew. Commercial Generic Bioprocessing Apparatus (CGBA) experiments that explored the ways biological processes are affected by Microgravity - the near-weightlessness of space - may allow researchers to better understand the nervous system. Scientists also plan to use the CGBA to investigate growing human tissue for use in surgical procedures such as skin grafts and organ transplants and in developing medicines. The primary purpose of the Protein Crystal Growth (PCG) Enhanced Gaseous Nitrogen (EGN) Dewar experiment was to demonstrate a low-cost platform for conducting a large number of experiments to determine the optimum conditions for growing large, high-quality protein crystals in space. Researchers require crystals of sufficient size and suitable quality for crystallographic analysis of their molecular structure by X-ray diffraction and computer modeling. EGN promises to give researchers greater access to space and the opportunity to conduct a statistically significant number of experiments per mission, which will increase the likelihood of obtaining crystals worthy of X-ray analysis. 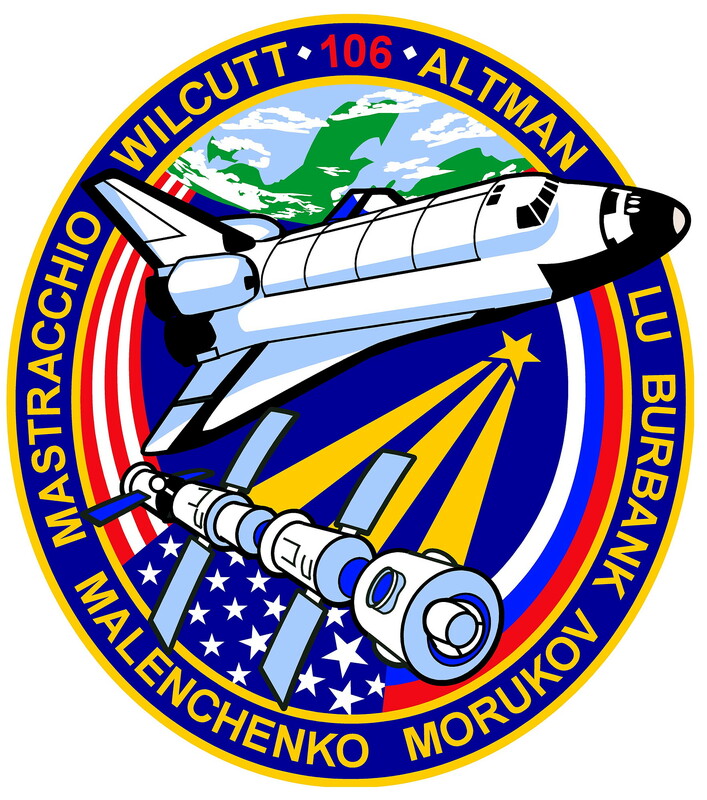 On the tenth day of the flight, Atlantis undocked from the ISS and Scott Altman conducted a flyaround of the newly expanded station to enable his crewmates to conduct photo documentation of the outpost.